Today we’ll have a look at a new tool, new “fling” as VMware calls it. It’s called VMware DRS Entitlement Viewer. It’s been just released and it allows you to get a hierarchical view of vCenter DRS cluster inventory with entitled CPU and memory resources for each resource pool and VM in the cluster. It installs as vCenter server plugin (HTML5) and allows being executed from there. You are able not only to view the values, but also export them as PowerCLI commands which you can then re-execute to apply the new values. VMware vSphere with vCenter Server appliance 6.5 and 6.7, a compatible VMware vSphere client (HTML5). Check the source site here. Once installed, you can see the new “DRS entitlements” section under the “Monitor” tab for each Cluster. When you’re just starting with virtualization, learning this technology, it’s important to understand the basics. If you’re not familiar with VMware or you want to learn more, you might start with this post What is The Difference between VMware vSphere, ESXi, and vCenter. Most popular in the SMB sector is the “Essential kits”. There are vSphere Essentials or Essentials Plus kits. The Essentials Plus includes 6 CPU licenses of vSphere Essentials Plus (for 3 servers with up to 2 processors each) and 1 license for vCenter Server Essentials. You’ll get VMware support for 1 year, within this bundle. 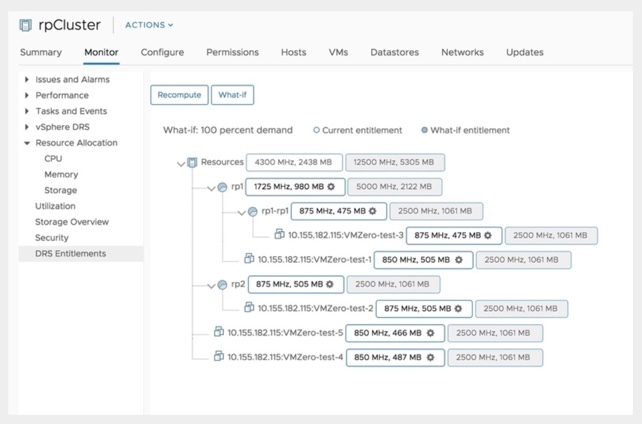 Lastly, we’d like to point out our new vSphere 6.7 dedicated page on this blog where you’ll find all the articles talking and teaching vSphere 6.7. Do u have a link we’re I can download it? You can download it from the source page at VMware Labs, as I wrote in my article. Thank you. It’s good information.